The Maelstrom 5 1/4" Dual Bay Reservoir is an advanced, versatile, and elegant coolant storage & recirculation system capable of operating either as a standalone unit, or with a single or a dual MCP35 class pump (MCP350, 355 or 35x). With factory pre-installed MCP35X housing (no pump) for DIY upgrade purposes. With factory pre-installed MCP35X2 housing (no pump) for DIY upgrade purposes. 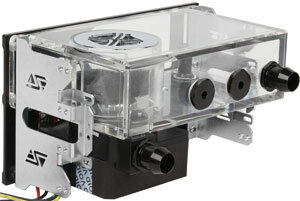 With factory pre-installed single PWM controlled MCP35X pump. With factory pre-installed dual PWM controlled MCP35X pumps. The image to the left shows the Maelstrom bay reservoir filled with various coolant colors. 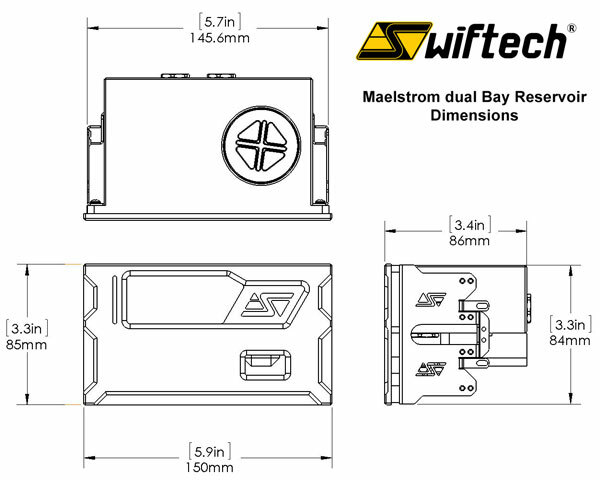 The Maelstrom operates either in standalone mode, or with one or two built-in Swiftech MCP35x series pumps (MCP350, 355, or PWM controlled 35X) using an MCP35X-H (for single pump) or an MCP35X2-H (for dual pump) housing - All options are factory pre-installed. Up to 3 return lines can be installed for loop parallelization. When assessing various component temperatures in a conventional (non-refrigerated) liquid cooling system, ambient air is the primary baseline from which everything else derives, i.e. no heat-generating component can ever be cooler than, or equal to ambient. The second temperature data that can also be considered as a baseline is the coolant temperature: it reflects the sum of the ambient air temperature plus the temperature resulting from the component(s) heat load multiplied by the thermal resistance factor (in layman terms the heat dissipation efficiency) of the entire loop. Thus, monitoring the coolant temperature in a liquid cooling system is essential at two levels: 1/ as an absolute value, you can monitor the cooling system health and be visually alerted of potential issues (overheating), and 2/ as a relative value compared to that of the ambient air, it provides a meaningful indicator of the system thermal performance and in particular its ability to dissipate the heat generated by the components under load. In this respect, the following table may provide a general guideline to assess the thermal performance of your liquid cooling system; please note that audible noise considerations will dramatically affect the qualifiers listed below. In effect, the lower the noise requirements are relative to the heat load, and the higher the thermal efficiency demand will be placed upon the system.